Stephen Kitras hand blows this unique feeder, with ripples of color that dance when the sun hits them. Look! Is that a Scarlet Tanager up there? And did we just spot a Goldfinch? We ooh and ahh over the vibrant plumage of our feathered friends, but what do they ooh and ahh over? This birdfeeder, of course. Stephen Kitras hand blows glass into a unique, organic shape, with ripples of color that dance when the sun hits them. He finishes each one with a piece of sturdy sisal rope. 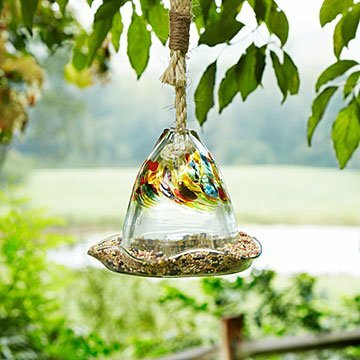 Fill it with seed or hummingbird nectar, and watch your backyard become even brighter. Handmade in Canada. Bought this for my mother for her birthday. She loved it, said that it was beautiful and the colors were nice in the sunlight. Excellent choice for my mom's birthday gift! SHE LOVED IT! Prettier in person than you can tell viewing it on-line. The way the light bounces in and through the feeder is beautiful.